Tomorrow is of course St. Patrick’s Day! How do you celebrate, if at all? For us it varies year from year as to what we do or do not do. This year I’ve just made this yummy dessert. Dinner is going to be something very simple and well, not so very Irish,haha! You can not go wrong with cheesecake or brownies so, mixing them together is a very happy and satisfying thing. 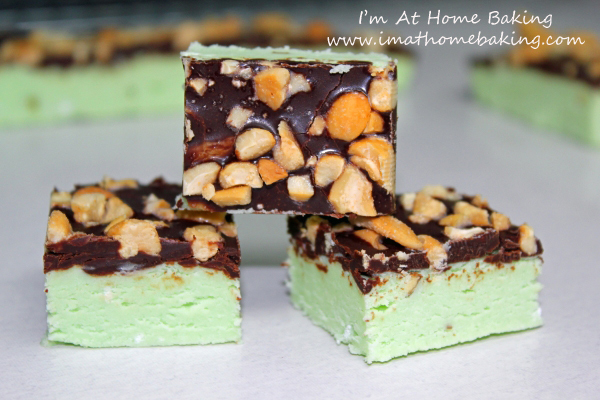 These are chocolaty, minty, fudgy and beautiful with the color green added to the cheesecake. The original recipe calls for a 11×7 pan. Not something I personally own. I made it in an 8×8 pan. My favorite, well pretty much my husband’s favorite brownie pan size. They come out nice and tall, thick and all around delicious. So feel free to adjust it to your favorite pan size. If you are at a loss as to what to make that will please everyone, try these! I am pretty sure they won’t disappoint even the pickiest of palettes. Preheat the oven to 350°F. Line the bottom and sides of an 11 x 7 baking pan or any size you prefer, with aluminum foil, leaving an overhang on all sides. Set aside. Melt butter and semi-sweet chocolate in a medium saucepan on medium heat, stirring constantly. Remove from heat and let cool to room temperature (about 15 minutes). Stir sugar into cooled chocolate/butter mixture until combined. Add in the eggs one at a time, whisking until smooth after each addition. Whisk in the vanilla & peppermint extract. Fold in the flour and salt. Pour batter into prepared pan, reserving ¼ cup of batter. With a hand-held mixer on medium speed or a stand mixer, beat the softened cream cheese, ¼ cup sugar, egg yolk, ¼-1/2 teaspoon peppermint extract, and 2 or more drops of food coloring in a medium bowl until completely smooth - about 1 minute. Using a cookie scoop dollop the cream cheese mixture on top of the prepared brownie batter. The with the cookie scoop, dollop the last ¼ cup of brownie batter. Tap down on your counter the pan so it settles a bit. Glide a knife through the layers, creating a swirl pattern. Bake brownies for 30-35 minutes, or until a toothpick comes out almost clean. Depending on the size pan you use it may take longer to bake. Check them at the 30 minute mark to be sure. Allow brownies to cool completely before cutting into squares. Brownies stay fresh stored in the refrigerator for 1 week. Welcome To Day 6 Of “25 Days Of Christmas Sweet Treats”! What a busy weekend ahead! It started today, the final steps to the end of preparation for our Command Holiday Party! I can’t wait for it to be done and out of the way. I know, that may sound a little bad but it’s been nothing but stress for me and did not turn out how I thought it all might,lol. On a much happier note, we will be finally getting our Christmas tree tomorrow! I am so happy and excited about that. This fudge is tasty but also pretty! 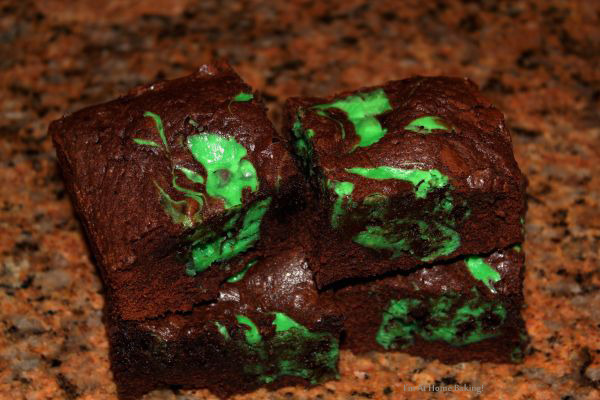 I was thinking, to enhance the green color a little, if you wanted, you could add a little food coloring to make the green stand out more, but no matter, they are super easy to put together, taste delicious and of course everyone loves the name too! LINE 8-inch square pan with foil, with ends of foil extending over sides. Microwave white chocolate, 6 Tbsp. butter and water in large microwaveable bowl on HIGH 2 min. or until butter is melted; stir with whisk until chocolate is completely melted and mixture is well blended. ADD dry pudding mix; stir 2 min. Add sugar, 1 cup at a time, stirring after each addition until well blended. Press onto bottom of prepared pan. MICROWAVE semi-sweet chocolate and remaining butter in large microwaveable bowl 1-1/2 min. or until butter is melted. Stir until chocolate is completely melted and mixture is well blended; spread over fudge layer in pan. Sprinkle with nuts. Refrigerate 2 hours or until firm before cutting into 36 squares. I used to enjoy celebrating this day but over the years one thing or another has stopped us from it. Usually it’s my husband having to work or something work related, weird hours…any number of things. So normally it just passes us by without much thought. Since my husband and a good handful of his coworkers actually had to work today, I decided to bake them a St. Patrick’s Day treat! For Christmas my husband bought me a Mini Whoopie Pie pan. I normally use a scoop and a cookie sheet to make my whoopie pies but I love having all kinds of different pans to make fun things. I decided to try it out. I have to say at first, it really was an experiment. I was using a recipe I’ve never used before as well as a pan I had never used. I have made Red Velvet cake before but it was a different recipe. So I followed the recipe to a T. It was an epic failure. The batter rose pretty high and looked like mini muffins instead. On the second batch I decided that 1 Tablespoon of batter was too much for this particular recipe, so I cut it down to 1 Teaspoon of batter. The smaller amount of batter did the trick and came out great I think! Of course cream cheese frosting goes with any kind of velvet cake and while most people like to use pounds of powdered sugar…I don’t really ever use more than a few cups, personal taste of course! I also never add milk to my frostings! I always end up with a light, fluffy and delicious taste and you can still taste the cream cheese in it. What were your plans for St. Patrick’s Day? Preheat Oven to 350, You could possibly get away with 325 with this pan! 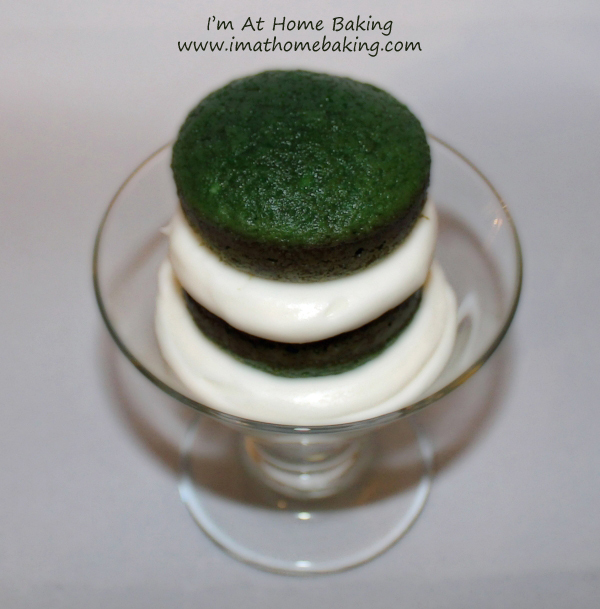 Grease your mini whoopie pie pan. Lightly whisk eggs in medium bowl. Add rest of wet ingredients, whisk until blended, set aside. Place all dry ingredients into your mixing bowl and stir together well. Place 1 teaspoon of batter into each cavity. Bake 9-10 minutes. Move to wire rack and let sit in pan for 2-3 minutes before removing cakes to completely cool. Cream together cream cheese & butter. Add vanilla unitl smooth. Using a sifter, gradually add in powdered sugar till it is your desired taste and consistency. Add milk if desired.